A newly-discovered report from the European Microfinance Network takes a comparative look at the environment for women’s enterprise development in eight countries – assessing relative levels of gender equality on six dimensions – and highlighting good practices in support for women’s entrepreneurship. It’s definitely worth a read, and worth a spot on your womenabling reference shelf. gender equality in access to finance. The countries are rated most highly on general gender equality in society, and lowest on support structures for women’s enterprise development. There was the most variability in ranking among the eight countries on the access to finance dimension. Scores are calibrated on a 1-5 scale. In no country and on no dimension did any country garner a 4 or higher. an organization for women business angel finance in France, Femmes Business Angels. The report also contains a number of very useful policy and practice recommendations, targeted to policy makers, practitioners, finance providers, and researchers. 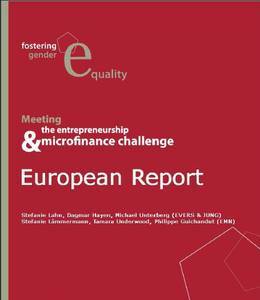 For more information on the European Microfinance Network, and to download the report, click on the links above. Thanks go to Zunia.org, a wonderful development news aggregator, for highlighting this report. This entry was posted in business, women's business development, women's business ownership, women's enterprise development and tagged Belgium, empowering women, Europe, European Microfinance Network, France, Germany, Hungary, Julie Weeks, Norway, Slovakia, Spain, UK WETF, United Kingdom, women's business development, women's empowerment, women's enterprise, Womenable by womenable. Bookmark the permalink. Greetings thanks a whole lot for a discerning article, I really discovered your blog in error when searching on Msn for another thing closely connected, regardless prior to i ramble on too much i’d just like to say just how much I treasured your post, I have saved your site and also taken your RSS feed, Yet again thank you very much for your article keep up the good work. It is nice to definitely find a site where the blogger is logical. Thanks for creating your blog. Keep the good information comming, we need more authors like you! It is nice to definitely find a site where the blogger is logical. Thanks for creating your web site.